Is bacon good for you or bad for you? Is chocolate good for you or bad for you...jurys out! Its not healthy living or a healthy meal but dam its good...if you like chocolate and salty bacon. I came across this years ago while living in Vegas a lady that I worked with came in one day with a bag full of chocolate covered bacon, She said "if someone hadn't already coined the phrase "bet you can't just eat one...!" It would have been mine. Some foods just sound wrong together but are just right, so as we are on a site with a sweet name - 'CAKE', lets talk food...wrong combinations of food. Right now i'm staying with an excellent chef and she is up for making anything...inspire me and everyone else with your unusual concoctions. I discovered the best Chocolate EVER courtesy Victoria a couple weeks ago when she recognized a big Japanese grocery store in our area and knew exactly which chocolate to get. It stays in the fridge, presumably so it won't melt, and oh my God. I think it must be half fudge. Royce Chocolate! My personal dream is to get one of their bags of chocolate covered marshmallows and eat it entirely by myself. 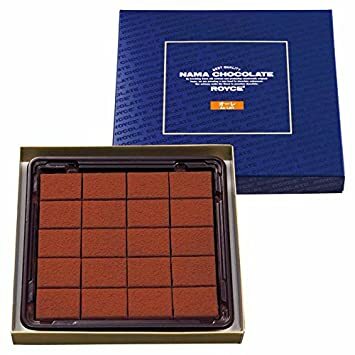 But in the meantime, it's best to get a box of their Nama chocolate to share.